It is the science of using colors to adjust body vibrations to frequencies that result in health and harmony. Humans need the sun’s light, which is broken into seven distinct rays, to live. If there is an imbalance in these colors within our bodies, it can manifest itself in mental or physical distress. Each color possesses frequencies of a specific vibration, and each vibration is related to different physical symptoms. Chromotherapy works on various energy points to help your body re-establish its natural balance. It accomplishes this via the full spectrum of visible light, each color of which addresses a separate bodily need. Dr. Iman's favorite colors are blue, green and pink! 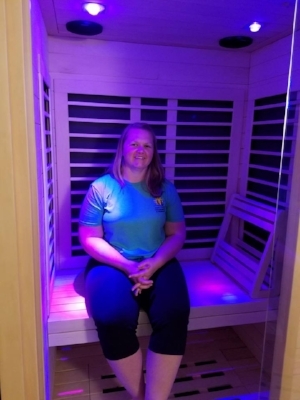 This is an additional feature in our Infrared Sauna that can be used at no additional charge. The lights are controlled by a remote and a list of the colors will be available to you during your session.